24½ in. (62.5 cm.) diam. The Rt. Hon. W.W. Pole, Wanstead House, Essex; his sale, Rogers, on the premises, 18 June 1822, either lot 342 or 343, 'A GRAND MATCHLESS DEEP CIRCULAR SIDEBOARD DISH, the Center most elaborately chased with The Feast of the Gods, Dolphin Ornaments round a superb Allegorical border, with beautifully moulded Edge in Burnish and Matted Gold, 25 inches' (probably purchased back by Rundell's, who had earlier supplied it and are known to have bought heavily in the sale). 1913 Bath House Inventory, p. 139, no. 683, in the Safe. 1914 Wernher Inventory, p. 95, no. 463. 1. 1808, Private Collection, United Kingdom. 2. 1809, formerly in the collection of the Dukes of Ormonde, presently at the Brighton Pavilion (acc. no. 344197). 3. 1809, in the Audrey Love collection, New York (A. Phillips and J. Sloane, Antiquity Revisited; English and French Silver-Gilt from the Collection of Audrey Love, London, 1997, no. 5, pp. 44-46). 4. 1809, in the Al Tajir collection (catalogue of the exhibition, The Glory of the Goldsmith, London, 1989, no. 127, pp. 164-165) and possibly the same as that sold, Sotheby's, London, 22 November 1984, lot 103. 5/6. 1809 and 1812, in the collection of Her Majesty the Queen (E.A. Jones, The Gold and Silver of Windsor Castle, Letchworth, 1911, p. 114, pl. LXVIII). 7. 1812, an oval chased version with repoussé and chased sides, with Partridge Fine Arts, 1995. 8. 1820, Sotheby's, New York, 12 December 1973, lot 240 (V. Brett, The Sotheby's Directory of Silver, 1986, fig. 116, p. 259). In spite of the statement in the Rundells' account that The Feast of the Gods was from a design of 'Michael Angelo', the actual design source for the central relief is a bronze plaque existing in three known versions, attributed alternatively to Alessandro Vittoria or Guglielmo della Porta, a Roman follower of Michelangelo. However, Rundell's direct source was almost certainly an engraving of this plaque in Bernard de Montfucon's L'Antiquité Expliquée et representée en figures, a highly influential series of volumes first published in Paris in 1719, and translated for an English edition in 1721. Montfaucon was a Benedictine scholar from the congregation of Saint Maur, whose travels in Italy from 1698 to 1701 led to his ambitious compilation of all images of antiquities known in his time. The fact that the present relief was a Renaissance and not an ancient Roman work was unknown to Montfaucon, who erroneously included later works based on antique themes as well as outright forgeries in L'Antiquité Expliquée. One can be almost certain that Rundell's owned a copy of Montfaucon's work, as another engraving from his book provides the subject for the relief plaque applied to the celebrated Bacchus and Ariadne sideboard dishes designed by Thomas Stothard and made by Paul Storr for Rundell's. Given that the dish was designed in the style of 'Michael Angelo', it is interesting to note that the London hallmarks, but not the maker's mark, appear to have been deliberately worn down later in the nineteenth century, so that, presumably, the dish could be sold as a Renaissance original to an unsuspecting client. William Pitts Senior was the son of the well-known epergne maker Thomas Pitts. From 1791 to 1799, William was in partnership with Joseph Preedy, producing fine neoclassical dessert-stands and other wares, but in 1799 and 1806 he registered alone at Goldsmith's Hall, entering his own mark. In 1806 his son, also William, joined him as an apprentice and the latter, by 1812, had become an important modeller and chaser in his own right. 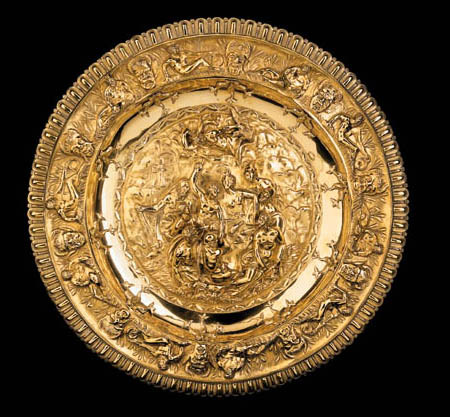 The son is known to have worked both on Stothard's famous Wellington Shield made for the retailers Green, Ward and Green and on Flaxman's Shield of Achilles for Rundell's. Sometime around 1808, William Pitts Senior seems to have decided to cater to the increasing interest in what could be called 'antique' silver. The fashion for old silver existed at least as early as the 1780s and no doubt before. In 1786, a Swiss visitor to London, Sophie von la Roche, wrote of her visit to the Royal goldsmiths Jefferys and Jones "(the) stock must be worth millions. I have never seen silver moulded into such noble, charming, simple forms... with the added pleasure of comparing the works of previous generations with up-to-date modern creations. These antique pieces, so Mr Jeffries said, often find a purchaser more readily than modern. This is because the English are fond of constructing whole portions of their country houses... in old Gothic style and so glad to purchase any accessions dating from the same or similar period." The Feast of the Gods, a bronze plaque attributed to Guglielmo della Porta circa 1575, 133/8in. high. Courtesy the Board of Trustees of the Victoria and Albert Museum, London. Plate from Bernard de Montfaucon's L'Antiquité Expliqué, London Edition, 1721, based on one of the three known Renaissance bronze versions of the Feast of the Gods, thought by Montfaucon to date from antiquity.